All natural, smooth, soothing deliciousness for your lips! 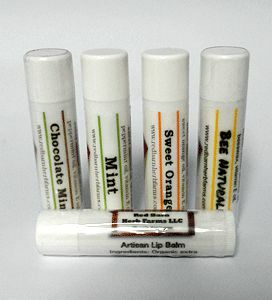 Our lip balm gets very good local reviews, and is effective for both healing and protection in all seasons. Feels great. Works. Handmade with all natural and organic ingredients including fresh, raw, local beeswax from our friends at Blowgourd Apiaries in Pisgah, AL. Base ingredients: Organic extra virgin coconut oil; organic mango butter; organic sweet almond oil; organic calendula flower; local beeswax; gmo-free vitamin e oil. Best lip balm EVER. I've been using Red Barn for years and have found nothing comparable.